For the first time, Thomas Oden's Systematic Theology classic series (individually titled The Living God, The Word of Life, and Life in the Spirit) is available in one complete volume. A renowned theologian, Oden provides a consensus view of the Christian faith, delving deeply into ancient Christian tradition and bringing to the contemporary church the best wisdom from its past. In this magisterial work, Oden tackles the central questions of Christian belief and the nature of the trinity. 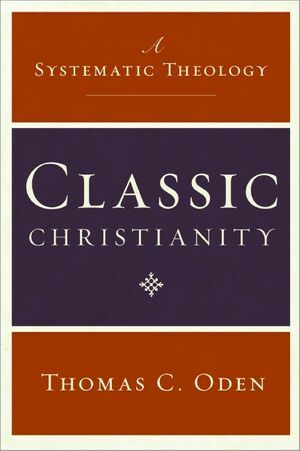 Written for clergy, Christian educators, religious scholars, and lay readers alike, Classic Christianity provides the best synthesis of the whole history of Christian thought. Part one explores the most intriguing questions of the study of God—Does God exist? Does Jesus reveal God? Is God personal, compassionate, free?—and presents answers that reflect the broad consensus culled from the breadth of the church's teachers. It is rooted deeply and deliberately in scripture but confronts the contemporary mind with the vitality of the Christian tradition. Part two addresses the perplexing Christological issues of whether God became flesh, whether God became Christ, and whether Christ is the source of salvation. Oden details the core beliefs concerning Jesus Christ that have been handed down for the last two hundred decades, namely, who he was, what he did, and what that means for us today. Part three examines how the work of God in creation and redemption is being brought to consummation by the Holy Spirit in persons, through communities, and in the fullness of human destiny. Oden's magisterial study not only treats the traditional elements of systematical theology but also highlights the foundational exegetes throughout history. Covering the ecumenical councils and early synods; the great teachers of the Eastern church tradition, including Athanasius and John Chrysostom; and the prominent Western figures such as Augustine, Ambrose, Thomas Aquinas, Martin Luther, and John Calvin, this book offers the reader the fullest understanding of the Christian faith available.